Although meat serves as one of the main sources of protein, cheeky little chickpeas are also packed full of protein, as well as being a great source of healthy fibre. 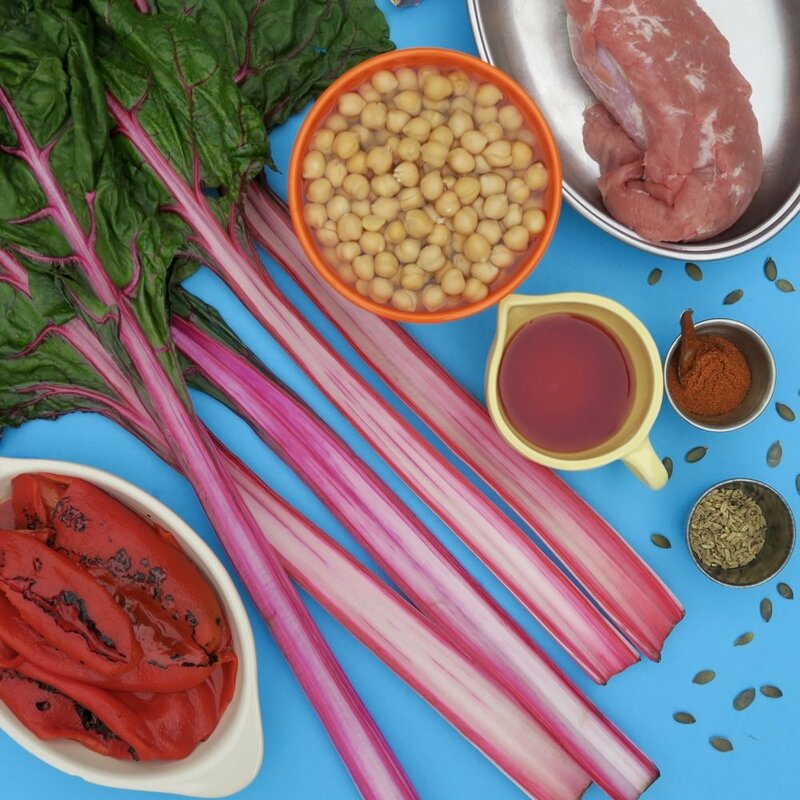 Team the recipe below with wonderfully colourful Swiss chard and you’ll be gaining a multitude of vitamins, plus magnesium, potassium and iron in your menopause diet. Pork fillet is a fairly low calorie, fab lean-meat option, lower in fat than other pork cuts. What fat there is, helps to absorb vitamins from food and provides the energy you need to support an active lifestyle. We adapted a Jamie Oliver recipe from his 5 Ingredients: Quick and Easy Food, as you can see we added a few extra ingredients. Put a large shallow casserole on a high heat. Season the pork with sea salt and black pepper, then place in the pan with 1 tbsp of olive oil and sear for 5 minutes, turning halfway. Remove the pork to a plate, turn the heat down slightly, then add a little more olive oil and fry the onion until it is soft, add the garlic, fennel seeds and paprika, cook to infuse the garlic and spices. Add the peppers, chard and sun dried tomatoes to the pan. Stir and fry for two minutes, then stir in the chickpeas and the juice, and bring to the boil. Sit the pork back at the bottom of the pan with any resting juices, cover and simmer on a medium heat for 12 minutes, turning occasionally, until the pork is cooked. Rest for 2 minutes, slice the pork, and season, adding a splash of red wine vinegar. Drizzle with extra virgin olive oil and sprinkle with toasted pumpkin seeds to serve.